1 in 10 Canadians have a learning disability, and doctors must be able to identify, diagnose, treat, and manage children who are struggling in school. 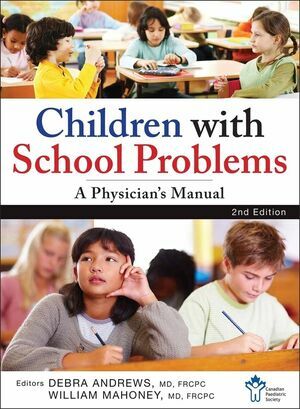 The first book specifically tailored for the needs of physicians working with kids with learning disabilities, Children With School Problems: A Physician's Manual covers such important areas as child development, diagnosing learning disabilities (including data gathering, screening and assessment, and physical examinations), management (medication, behavioral management, and educational interventions), and prevention (including literacy promotion). Written by trusted experts from the Canadian Paediatric Society, Children With School Problems is filled with practical tools and resources that physicians—including paediatricians, family physicians, and paediatric learners—can use to diagnose and treat children with learning disabilities. Physicians want to know more about learning disabilities, and parents want their pediatricians and family physicians to provide more help when their kids struggle in school. Children with School Problems provides that information, making it an invaluable resource for any doctor working with kids. The Canadian Paediatric Society is a national professional association, representing more than 3,000 paediatricians, paediatric subspecialists, paediatric residents, and other health professionals who work with and care for children and youth. The CPS is active in professional education, public policy advocacy, surveillance and research, and education for parents and caregivers. Dr. Debra Andrews is associate professor of paediatrics and divisional director for developmental paediatrics at the University of Alberta. She is medical director of two tertiary interdisciplinary programs at the Glenrose Rehabilitation Hospital that provide assessment and intervention for school-aged children with complex learning and behavioural problems. Dr. William Mahoney is a clinical associate professor of paediatrics, Faculty of Health Sciences, McMaster University, and has worked with children with school problems for over thirty years. He is the former medical director of the developmental paediatric, rehabilitation, and autism programs of McMaster Children's Hospital.